Locally, the Lough Derg area has lovely villages with great pubs, cafes and food producers. A tour around the lake will bring you to cheese-makers, artists, heritage sites, artisan food producers and more. Our local village has two award winning pubs with music, food and most importantly, warm welcomes for you, our guest. Together we have created our cottages to be warm and welcoming, restful and tasteful, yet providing all you need for a relaxing and entertaining break. We value the traditional rural landscape and we strive to ensure that our farm remains a patchwork of fields with havens for wildlife and diversity. We will provide you with seasonal produce from our garden and our happy hens are renowned for their tasty eggs! We respect your privacy, yet we are still nearby should you need us. Terryglass is a village steeped in a long and distinguished history; the monastery was founded by St Columba in 549 A.D. Frequently raided by the Vikings, the abbey was burnt down in 1264, its remaining wall can be seen at the back of Paddy’s pub in the village. We have two pubs, Paddys and The Derg Inn (which also has a small shop). The local community is very proud of the village and great care is taken to preserve its appearance. As a result of this, the village has twice won the award of being ‘Irelands Tidiest Village’. There are two spring wells. One, St Augh’s, known locally as the ‘Eyewell’, is to be found at the quay. Local folklore has it that the water from this well has curative powers. The second spring, known as the ‘Headache well’ is located further up the village, its water is reputed to cure headaches! Enjoy the flurry of farm work as farmers plant, tend and harvest their crops throughout the year. Each season in this quiet and beautiful rural area brings its own changes and attractions. From Spring to Autumn the countryside welcomes you to enjoy all it has to offer, while Wintertime too brings its charms as you cosy up in your cottage after a peaceful walk or cycle followed by an invigorating sauna. 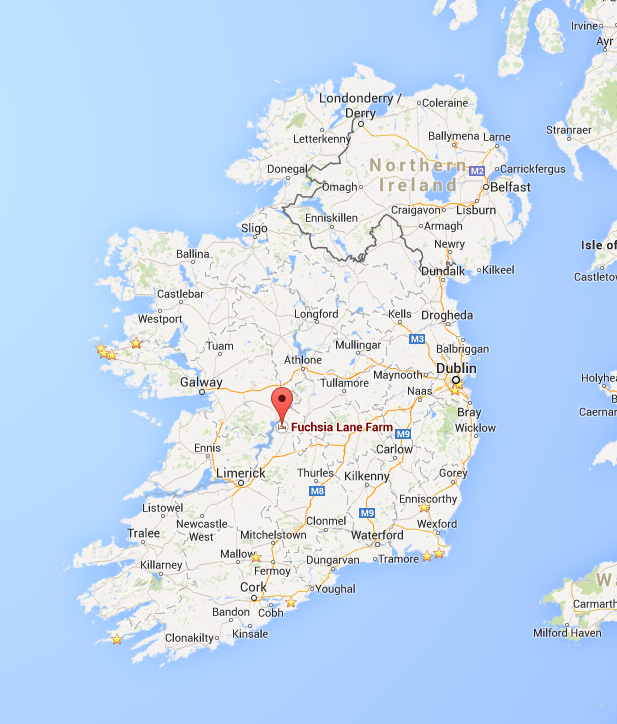 Fuchsia Lane Farm is also easily accessible from Cork and Kerry airports; to drive from Dublin or the South-west take the N7/M7, or take the train to Nenagh, the gateway to the region. Check out the map for further information.